With MPs set to vote once again on whether or not to accept the Prime Minister’s Brexit deal this afternoon, a snap YouGov poll conducted this morning finds that Britons remain divided on what their representatives should do. 38% of Britons want MPs to once again reject the Brexit deal, while 33% want them to pass it. The remaining 29% answered “don’t know”. Should the deal indeed be accepted by the House of Commons, Theresa May has pledged to stand down as Prime Minister. 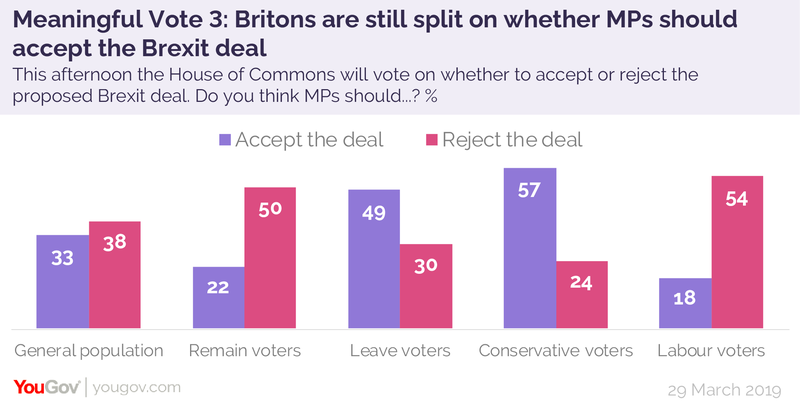 Two weeks ago, the public were similarly split on whether or not to accept the Brexit deal, with 32% wanting to accept it, 36% wanting to reject it and the remaining 32% unsure. While Britons as a whole may be split, those who voted for Britain to leave the EU back in 2016 want to see MPs pass the bill by 49% to 30%. Conservative voters are even more in favour, urging the Commons to accept the bill at a rate of 57% to 24%. Opposition comes instead from Remain voters and Labour voters – the former wanting MPs to throw out the deal by 22% to 50%, and the latter by 18% to 54%.